When I was growing up, I would constantly be begging my Dad to take me fishing. I know what you’re thinking, what kind of young boy enjoys fishing. I mean it can be very boring, you can get sea sick, and a lot of the time come back home with nothing. But what may have been boring and lame to a lot of my friends was my heaven as I thought of nothing better to do than fish. I loved being out on the water, as I found it so calm, and even though I would sometimes catch nothing I still felt exhilaration even if I just saw a fish swim by. But nothing beat the moment when you would catch something. That incredible feeling of having a bite and then reeling her in is purely indescribable. The best part? Eating what I caught with my family when I returned home. I loved knowing that we were eating because of something I did and I could take such pride in that fact. Fishing made me appreciate how the world works a lot and I have such a respect for our farmers and fishermen who bring food to our plates. I find there is just way too much processed food available to buy today that nothing beats a real meal, with real meat and vegetables. In order to start fishing of course you need a great fishing rod. Whether you are a beginner or doing this for years, I hope to share with you my thoughts on a certain brand so that it can help your decision on what to spend money on. 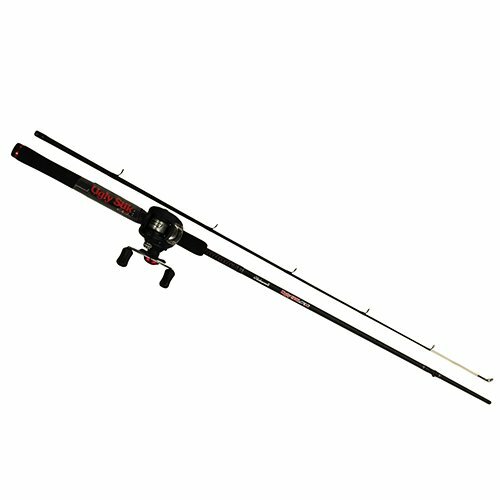 One of the fishing rods on the market today is the Shakespeare UglyStik GX2 Baitcast Rod and Reel. It has been made to offer you the best experience while you are out on your boat fishing. Before I get into my final verdict, I must give my biggest piece of advice to you. Any fishing rod, at the end of the day, comes down to personal preference. Even though I may like some more than others, that is my own personal preference and yours may vary. I always recommend that you go in person to a local store that has this rod on display, or find a friend that has one, and test it for yourself before you buy it. Never buy a fishing rod without having held it in your hands before you bought it. That being said, I actually do recommend buying the Shakespeare UglyStik GX2 Baitcast Rod and Reel but only if you are a beginner or just looking to casually fish. This is no way, by any means a fishing rod for professional fishermen. I have found that because it is so lightweight that it can have the potential to break easily. However, that being said, the lightweight feature is also a great option especially for people going on excursions and don’t want the pain of carrying something so heavy on their trip. With all of this in mind, the Shakespeare Rod comes with a fantastic warranty so even if it does break and it is not your fault, you will be able to either get your money back or have a new one shipped to you. Warranty’s always make my heart beat a little bit slower, and I can relax on a purchase knowing that it is protected. I wish you all the best with fishing and if you are just starting, thank you for keeping this great sport and tradition alive! Happy fishing!